To all our valued customers, BusOnlineTicket.com would like to share some good news with you. We are so excited to announce the launching of Star Shuttle Express new bus service from Hentian Duta to KLIA or KLIA2. Book your Star Shuttle new bus service ticket at BusOnlineTicket.com now! Star Shuttle Express is one of the popular bus company in Malaysia. The headquarter office of Star Shuttle Express is located at Kuala Lumpur. Star Shuttle Express is well-known in providing a direct, non-stop and returned shuttle service from various places to KLIA and KLIA2. The bus ticket price for the new bus services mentioned above is charged reasonably from RM 12.00 per way. Please note that the drop off point in KLIA is located at the lower ground floor of KLIA Airport while the drop off point in KLIA2 is located at KLIA2 Aiport Level 1 Transportation Hub Platform A4. 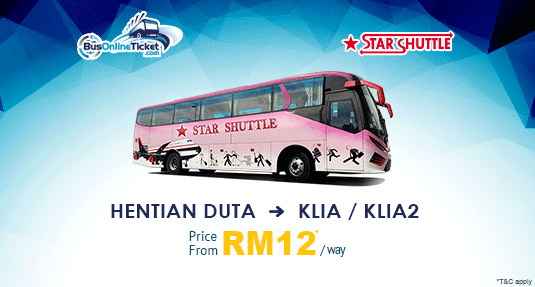 Booking Star Shuttle Express bus from Hentian Duta to KLIA or KLIA2 at BusOnlineTicket.com is easy and secure. You can choose your preferred departure date and we will provide you with the list of available trips for booking. Make sure you arrive at the airport early to catch your flight on time. Bon Voyage!